Notepad is one of the most useful tools to write and read files on a computer. One issue with traditional notepad is the inability to access it from another computer or device. Well, we have a solution to that problem with the introduction of web-based notepad. What do you think about having a Notepad where you can write, save and read from anywhere you want? Google Chrome has a web app which lets you write, save and read on a web-based Notepad. You are no longer burdened to carry the files with you when you write and save them on this online notepad. From any device (Android phones or Computers) you can access it once you have synchronized the file. This Google Chrome App is named as Quick Note and it can be used as a clipboard, scratchpad or even notepad. Quick Note is a lightweight online notepad where you can write and save. You can access the saved files from anywhere if it is saved in Quick Note. All you need is a Google account and PC with Internet access. You can access the saved files using the username and password. 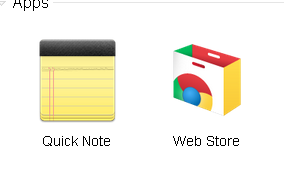 In order to install Quick Note, you need to visit Google Web Store with Chrome browser. If you are using a different web browser, you cannot download and install Quick Note. To install this App on your computer, you must click on the plus button. If you are having older version, you must click on the install button. Now the installation process will begin. You may be prompted to log in to your Google account to continue the installation. If so, you must enter the Gmail username and password to complete the installation. Now let us check how to start this App on your computer. After installing it, you will see a window like this. Click on 'Quick Note' to start the application your computer. As the name tells, this application is not limited to the device on which the app is installed. You can access the data you saved from any devices which are connected to Internet. So you can save or edit saved files remotely.